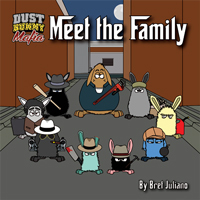 Also, in honor of Saint Patrick’s Day, we have a very special Dust Bunny Mafia style St. Paddy’s Day comic over on our facebook page, go check it out! Jimmy the Nose: "Thanks again Giovanni, another exceptional meal." Giovanni: "Gratzi Jimmy. I certainly appreciate your business. Send Leo my regards." Giovanni: "Luciana, take some cannoli back to the boys, it’s on the house!" Leadfoot Lucy: "Oh I don’t know Gio." [whispering] "Jimmy? Psst! Jimmy." Jimmy the Nose: "CANNOLI!!! That's the answer!" Leadfoot Lucy: "Yes, Giovanni gave us a box of cannoli, they’re in the back."